Thanks to Justin Baeder from The Principal Center for guest-blogging on an issue instructional leaders face daily: making room in your schedule for frequent classroom walkthroughs, and keeping it that way. 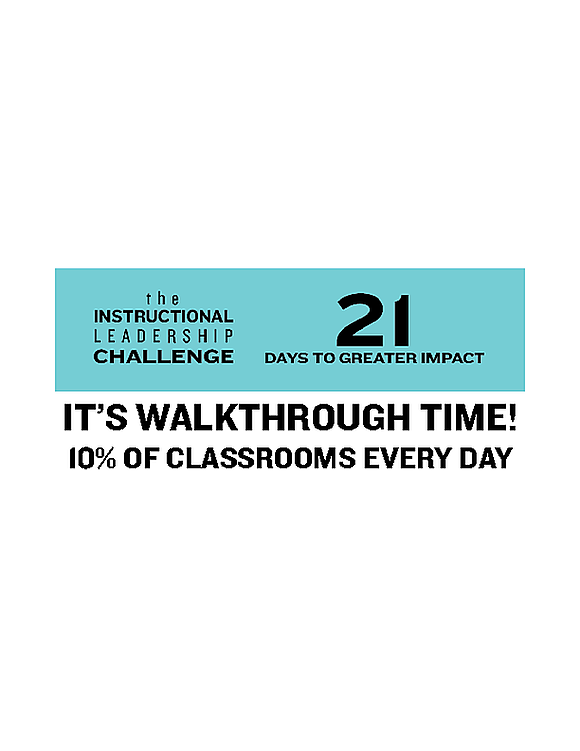 In the 21-Day Instructional Leadership Challenge, we challenge school leaders—more than 2,600 from 34 countries at last count—to get out of the office and into classrooms every day. We believe that by visiting every classroom on a two-week rotation, school leaders can still keep up with their administrative work while becoming dramatically more present in classrooms, and more involved in leading instructional renewal. But how can we make time? In an already-full day, how can we fit in a significant number of classroom visits? Here are our top strategies from the Challenge. If you like what you see, join The Challenge and we'll take you through the full habit-building experience over the next few weeks. We've all had grand visions of spending the majority of our time in classrooms, but we need to strike a realistic balance. It's neither practical nor helpful to spend hours upon hours doing walkthroughs when there's more pressing instructional leadership work to do. On the other hand, we need to face the fact that most teachers get visited rarely, if at all. What's the right balance? We recommend visiting 10% of the classrooms you supervise each day, so that in 10 school days, you'll see them all. It's not enough to tell yourself you want to visit 4 classrooms today. You have to plan for it. We don't always accomplish everything we schedule...but we rarely accomplish anything we intend to do without setting aside time. But in our line of work, interruptions are inevitable—we can expect them, so they shouldn't be an excuse. That means we need to schedule more timeslots for classroom visits than we'll actually need. Depending on how frequently you get interrupted by emergencies—for example, if you're the assistant principal who responds to all discipline calls from teachers—you'll want to pick a multiplier somewhere between 1.5 and 3. So, if you need to visit 4 classrooms a day, you might identify 6 to 12 timeslots, each about 10 minutes in length, in which you can walk to, observe, and walk from a classroom. If you don't get interrupted, you may find that you finish your walkthroughs by 9:30 a.m. On other days, you may just barely get them all in. Either way, when you've hit your target, you can re-allocate the remaining timeslots you've set aside. The key is to realistically set aside enough time for the walkthroughs and the interruptions that will inevitably pop up. Do this, stick to your schedule, and you'll find walkthroughs more than doable. A true emergency, of course, should trump your plans for classroom walkthroughs. Safety issues, crises, and other urgent and important matters will interfere with your walkthrough schedule, and that's fine. But true emergencies aren't the main source of interruptions. It's the semi-emergencies, ambiguous situations, and important-but-not-urgent situations that most often impinge upon our walkthrough time. To deal with non-emergencies more effectively, think about the issues that you're always called upon to deal with, but that could wait five or ten minutes while you finish a walkthrough. Most students who are sent to the office, for example, don't need to see you instantly. They can wait a few minutes while you finish a walkthrough and return to the office. Ultimately, whether a situation becomes an interruption depends on your secretary's judgment and the expectations you've set. Take a few minutes to brainstorm a list of emergencies, a list of semi-emergencies that can wait a few minutes, and non-emergencies that should never interrupt walkthroughs. Then, ask your secretary to do the same thing, and compare lists afterward. Talk about the differences in your lists, and clarify what should warrant an interruption to your walkthrough schedule and what shouldn't. You probably already visit most classrooms most months, but if you make an exhaustive list, it's likely that you'll find a few classrooms that you tend to avoid. Perhaps it's the portables out in the parking lot, or that one teacher on the secnd floor who's always grumpy when you visit, or that one teacher who has her prep period when you do most of your walkthroughs, or the part-time teacher who's only on campus one day a week. Whatever the reason, you'll find that it's hard to visit everyone, every two weeks, without actually keeping track in writing. Make a list, or have your secretary make a list, and go through it in order. Write down the date and time of each visit for each teacher. That way, you'll avoid over-visiting the easy and fun classroom, and avoid leaving out the classrooms that might be more of a challenge to visit. You'll find it easier to fit in several walkthroughs a day if you keep them short. It's tempting to want to see a whole lesson, or stay until a break so you can chat with the teacher, but that can make the whole effort unsustainable. If you want to do high-impact walkthroughs, keep them short. There are diminishing returns to staying longer, and it's more important to be consistent than to maximize your time in any one classroom. If you don't see anything to comment on in your first five minutes, you might choose to stay another five minutes, but if it's just not a good time to be there—for example, if a chemistry class is cleaning up after a lab and there's not much instruction going on, by necessity—it's fine to come back later. Keep your walkthrough visits to five or ten minutes, and you'll have a much easier time sticking to a two-week rotation. Each day, your goal should be to visit 10% of your classrooms. You might adjust this slightly for certain days of the week if you have more time on some days than others, but set a specific goal for each day, and keep track of it. If you hit your goal for the day, celebrate! Tweet with the hashtag #ilchal and we'll celebrate with you. If you need to get a bit more heavy-handed with yourself, here's the "nuclear option" for getting into classrooms: deputize your secretary to steal and hide your desk chair if you're not sticking to your schedule. It's amazing how much easier it is to be in classrooms when we don't have an alternative! For more information on the Challenge, check out the website. Justin Baeder is Director The Principal Center and creator of the 21-Day Instructional Leadership Challenge, in collaboration with Jason DeRoner and Jill Lubow of TeachBoost. You canfind Justin on Twitter at @eduleadership.